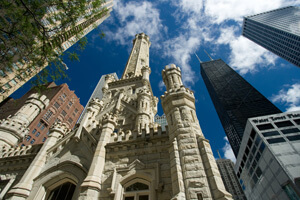 On March 25, 1867, the cornerstone was laid at the famed Chicago Water Tower, which still stands today amidst towering skyscrapers including the 100-story John Hancock Center. The tower is the most famous structure to survive the Great Chicago Fire of 1871 and its supply of water was critical to saving a number of buildings in the vicinity during the conflagration. Celebrating Chicago's rise from the ashes to become one of the world's greatest cities, here is an excerpt from the Cavaliers' 2005 closer that pays tribute to the Windy City.